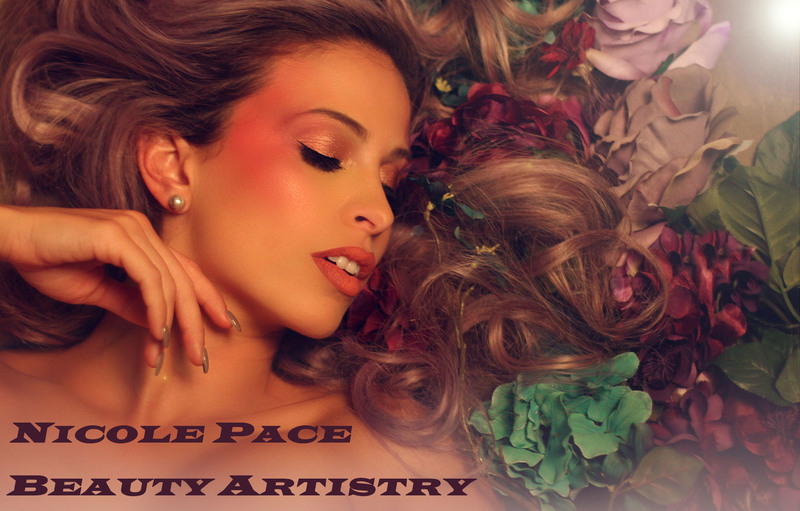 Nicole Pace has been a licensed and certified hair and makeup artist since November of 2005. Based out of Orlando, Florida and surrounding areas; Nicole often travels to cities such as Miami, Tampa and Jacksonville. Specializing in commercial and production work, HGTV, editorial, beauty, weddings, injury simulation, and character makeup, clients will experience the very best of hair and makeup application. Nicole Pace is completely mobile and works out of a fully stocked hair and makeup and mens’ grooming kit. Nicole Pace has worked with prestigious clients such as: Marriott Resorts, Wyndham Resorts, Hilton Hotels and Resorts, CNN, MSNBC, CBS, ESPN,TRU TV, Fox News Network, ABC, Telemendo, Embry Riddle, University of Florida, Uber, Nickelodeon, M&MS, Coca Cola, Disney, Spectrum, Humana, Petsmart, Publix, Cymbalta, BET, Fairwinds Credits Union, Carnival Cruise Lines, Norwegian Cruise Lines and Florida Lottery along with several politicians, published photographers, and celebrities. As a primary makeup artist and hair stylist/mens' groomer for MSNBC in central Florida, Nicole Pace has done hair and makeup for Mark Halperin for MSNBC Bloomberg TV. She has also worked on the Mad Money television show with Jim Cramer. While working with Universal Studios Orlando, Nicole Pace has worked as a hair stylist/mens’ groomer and makeup artist on several promotional advertisements and commercials including Margarittaville, Universal 360, Halloween Horror Nights, Mardi Gras, Islands of Adventures, Volcano Bay Water Park, The Hulk, Jurassic Park, Cat in the Hat, Spiderman, Men in Black, The Simpson's Ride, Pow Wow, Grad Bash, Red Coconut Club, Hollywood Drive in Golf, Antojitos Authentic Mexican Restaurant, NBC's Sports grill and Brew City Walk, NBC Universal Studios Holiday TV, Red Oven Pizza Universal City Walk and NBC's Super Ball XLIII. Nicole Pace has also had the pleasure of working as a hair and makeup artist on NBC Universal Studios resort advertisements and promotions, such as Sapphire Falls Resort, Portifino Bay Hotel, Hard Rock Hotel and Cabana Bay Resort. In addition to working as a hairstylist/mens’ groomer and makeup artist for NBC Universal Studio Orlando theme parks, restaurants and resort advertisements and commercials, she has also worked on the international campaigns for NBC Universal Studios Dubai and Japan. Nicole Pace was the key makeup artist and hair stylist/mens’ groomer for the annual NBC/ Warner Brothers Harry Potter Celebrity Convention; working with Helena Bonham Carter, Rubert Grint, Tom Felton, Alan Rickman, Matthew Lewis, Bonnie Wright, Robbie Coltrane, Warwick Davis, Oliver Phelps, James Phelps and Devon Murray. Other clients Nicole Pace has worked on as a key makeup artist and hair stylist/mens’ groomer for include: WWE, Spike TV, TNA and Impact Wrestling. While working for WWE, Nicole did hair and makeup for Hulk Hogan, True Divas star Paige, Chris Jericho and Daniel Bryan for the reality/competition show "Tough Enough." As a key artist for TNA and Impact Wresting, Nicole has worked with Hulk Hogan, Kurt Angle, A.J. Styles, Jeff Jarrett, the Hardy Boys, Vince McMahon, MMA super star/TNA wrestler Bobby Lashley, Sting, Ric Flair, Booker T, Mick Foley and Billy Corgan. Nicole Pace was also cleared as an outstanding citizen in order to do hair and makeup for NASA and Kennedy Space Center; along with the CNN Tea Party Republican Debate, the Republican National Convention, the GOP Convention and 60 minutes with Scott Pelley and Bill Gates. Some of the politicians Nicole has had the pleasure of working with include: Vice President Joe Biden, Condoleezza Rice, Mitt Romney, Senator Ted Cruz, Orlando mayor Buddy Dyer and Florida governor Rick Scott. As the primary makeup artist and hair stylist/mens' groomer in Central Florida for CNN/HLN, CNN Latino and CNN International; Nicole Pace has worked with Anderson Cooper, Don Lemon, Erin Burnett, Pierce Morgan, Brooke Baldwin, Ashleigh Banfield, John Berman, Wolf Blitzer, Pamela Brown, Jean Casarez and Chris Cuomo. Nicole has also worked as key makeup artist and hairstylist on Fox News for the Hannity Show. Nicole Pace has worked as a key makeup artist and hair stylist/mens' groomer for NBA, PGA and NFL celebrities and national ESPN sports casters such as: Adam Schefter, Matt Hasselbeck, Jon Gruden, Grant Hill, Dan Marino, Arnold Palmer, Sean Foley, Martin Hall, Jim Mclean, Cameron McComerick, Martin Chuck, Andrew Rice and David Feherty. She has worked as a makeup artist and hair stylist/mens’ groomer for the Golf Channel and PGA Tour Superstore commercial advertisements; as well as a ESPN sponsored Dunkin Donuts advertisement commercial and the Golf Channel’s “Altered Course: Jamaican Edition” reality show. Nicole Pace has had the pleasure of working with the U.S.A Olympic women’s' volleyball team and as the head makeup artist and hair stylist for the Tampa Bay Storm cheerleaders and the Orlando Predators dance team. Along with the previous clients listed, Nicole Pace has been fortunate to work as a makeup artist and hair stylist/mens’ grommer with celebrities such as R&B artist T-Pain, Joey Fatone and Chris Kirkpatrick from NYSYNC. She has also been the makeup artist and hair stylist/mens’ groomer for the pop group/tv show Time Rush. Nicole Pace has been key makeup artist and hair stylist/mens' groomer on the reality show "Growing up Gator" and for TRU TV's Impractical Jokers. Other clients include national food chains and prominent businesses, such as Darden Restaurants: Olive Garden, Long Horn Steak House, The Capitol Grille, Seasons 52 and Bahama Breeze. Nicole Pace has also been the makeup artist and hair stylist/mens’ groomer for promotional advertisements and commercials for Central Florida Sun Rail, Hooters, Wing House, Kia Motors Kentucky, Holler Dealership, Chevy Motors Philadelphia, Toyota Motors Philadelphia, JP Morgan, Scholastic Book Fairs, One Blood Bank, QVC Pharmacies, Chase Bank Manhatten, Six Hour Energy Drink, Platos Closet, Waldorf Astoria Resorts, Monarch Hotels and Resorts, Lake Nona Resorts and Golf National and GodTV. Specializing in print and editorial work and national and local fashion campaigns, Nicole Pace has been the key makeup artist and hair stylist for national publications such as: People Magazine, Destination Weddings and Honeymoon Magazine, Parenting Magazine, Orlando Style Magazine, Teen Vogue Magazine, Shape Magazine, Muscle and Fitness Magazine, World Class Wedding Magazine, Family Circle Magazine, Mommy and Me Magazine, Florida Realtor Magazine, Garden and Gun Magazine, Central Florida Bride Magazine and Dark Beauty Magazine. Nicole has also served as a makeup artist and hair stylist for P&G fashion shows and product launches, P&G Cover Girl Cosmetics product launches, Premier Orlando Hair Show fashion shows and product advertisements, Jafra Cosmetics product launches and Cabi fashion shows.